THE CHRISTMAS SEASON opened last Saturday, in Jacinto City, with the Annual Christmas Parade down Market Street, ending at the TownCenter. 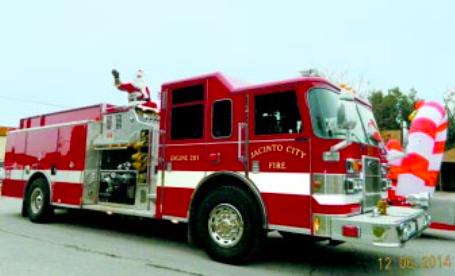 Prominent in the Parade was Santa Claus, riding on a Jacinto City fire truck. 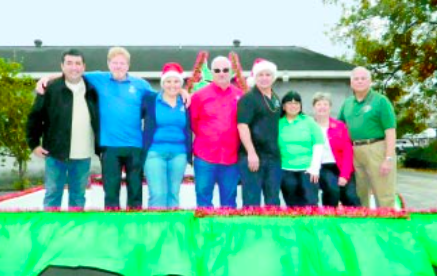 Heading the Parade was a float with city officials, Congressman Gene Green and Sheila Jackson Lee. About 25 units were in the Parade, and prizes were awarded by the three judges. Awards were: Most Beautiful, Chica’s Revolution Zumba; Most Original, Jacinto City Elementary; Best Marching/Walking, Scroggins Toe-Tappers; Mayor’s Choice, North Channel Martial Arts; and Honorable Mention, Galena Park Jacketeers. Hundreds watched the parade on Market Street, and then assembled at the TownCenter for the program. Trophies were awarded at this ceremony, and music was provided by the Roger Matheny Family, and performed by Councilman Allen Lee and the Jacinto City Elementary Honor Choir. Santa was present in the Gazebo to greet and hear children’s wishes, and the finale was the lighting of the Tree. Santa, Mrs. Claus and the HCSO elves made a stop at the Children’s Assessment Center (CAC) past Friday, December 5 to deliver a truck-load of toys to abused children. The toys were delivered this morning in an 18-wheeler preceded by a caravan with Santa, Mrs. Claus, Sheriff Garcia, the HCSO Mounted Patrol, and other members of the Sheriff’s Office. Now in its 20th year, the HCSO’s annual toy delivery has granted Christmas toy wishes to thousands of clients of the Children’s Assessment Center. The toys are destined for clients of the CAC, whose mission is to provide a professional, compassionate, and coordinated approach to the treatment of sexually abused children and their families and to serve as an advocate for all children in our community. San Jacinto College System Chancellor Brenda Hellyer attended the summit, and committed to increasing the graduation rate. PASADENA, Texas December 4, 2014 – Today in Washington, D.C., San Jacinto College Chancellor Dr. Brenda Hellyer, will join President Obama, the First Lady, and Vice President Biden, along with hundreds of college presidents and other higher education leaders, to announce new actions to help more students prepare for and graduate from college. 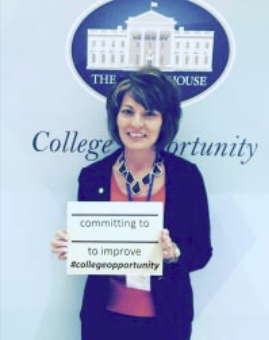 The White House College Opportunity Day of Action helps support the President’s commitment to partner with colleges and universities, business leaders, and nonprofits to support students across the country to help our nation reach its goal of leading the world in college degree attainment. Making sure students complete what they started has always been a priority for San Jacinto College, and participation in today’s White House Summit will build on existing initiatives and efforts already in place to promote completing a college degree. 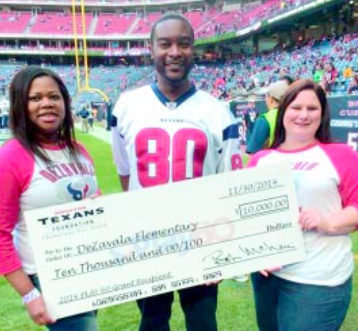 Among those initiatives are Intentional Connections, College Success Interventions, Men of Honor and Women of Integrity, Acceleration in Mathematics (AIM), student success courses and faculty advising attached to the course, and an integrated reading and writing program.